Tashee Singleton, Director of Public Housing Operations oversees what was formally known as Public Housing. For those who may not be aware, the Columbus Housing authority has been transitioning from traditional Public Housing to affordable housing which is project-based vouchers plus tax credit. Singleton, a military brat, is originally from Petersburg, Virginia. Her family had been stationed in Oklahoma, Germany and Ft. Benning when she was in elementary school. When her father decided to retire he decided to do so in Oklahoma. Not wanting to be too close to family she decided that she would move to Columbus and attend college. A 2003 graduate of Columbus State University with a B.A. degree in Accounting with a minor in Computer information Systems she received her first job at the university in their Real Estate Foundation Properties. 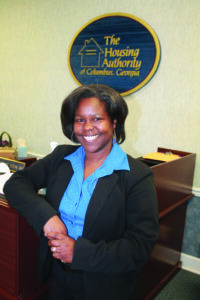 In 2010 she joined the Housing Authority as the comptroller and remained in that position until May of 2014 at which time the Housing Authority decided to divide the responsibility of the housing communities into two positions and she assumed one of the positions as Director of Public Housing Operations. Today, in her current capacity, she supervises 32 individual and oversees all of the affordable housing communities in Columbus except Arbor Pointe, South Commons and Patriot Pointe.